Witness the heroism behind one of the most sophisticated manhunts in law enforcement history in the critically acclaimed film Patriots Day, arriving on Digital HD March 14 and 4K Ultra HD Combo Pack (plus Blu-ray and Digital HD), Blu-ray Combo Pack (plus DVD and Digital HD), DVD, and On Demand March 28 from Lionsgate and CBS Films. Director Peter Berg (Lone Survivor, Deepwater Horizon) and Academy Award nominee Mark Wahlberg (Best Supporting Actor, The Departed, 2006) reunite in this intense and courageous story of a tragedy that shocked the nation. Patriots Day features an all-star cast including Golden Globe winner Kevin Bacon (Mystic River), Golden Globe winner John Goodman (Argo), Academy Award winner J.K. Simmons (Best Supporting Actor, Whiplash, 2014) and Golden Globe nominee Michelle Monaghan (TV’s “True Detective”). 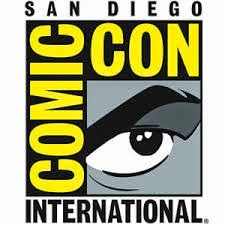 SANTA MONICA, CA – February 24, 2017 – Based upon the dramatic real-life manhunt for the Boston Marathon bombers, this powerful action-thriller follows Police Sergeant Tommy Saunders (Mark Wahlberg) as he joins brave survivors, first responders, and investigators in a race against time to find the bombers before they strike again. Directed by Peter Berg and featuring a stellar cast, Patriots Day is a stirring tribute to the Boston community’s strength and courage in the face of adversity. 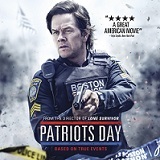 The Patriots Day 4K Ultra HD, Blu-ray, and Digital HD releases have over 90 minutes of bonus material including five behind-the-scenes featurettes: “Boston Strong: True Stories of Courage” tells the true stories of three first responders, “The Boston Bond: Recounting the Tale” reveals, through the eyes of the cast and crew, how a city that was challenged by tragedy rose above it to thrive; “The Real Patriots: The Local Heroes’ Stories” highlighting the real heroes from the marathon bombing; “The Cast Remembers,” featuring Mark Wahlberg and the cast discussing what drew them to the film; “Researching the Day,” showing how Peter Berg worked with an FBI technical advisor and researcher to tell this story as accurately as possible, as well as a two-part series showing the actors meeting their real-life counterparts. The Patriots Day DVD bonus material includes the “Researching the Day” as well as”Boston Strong: True Stories of Courage” featurettes. 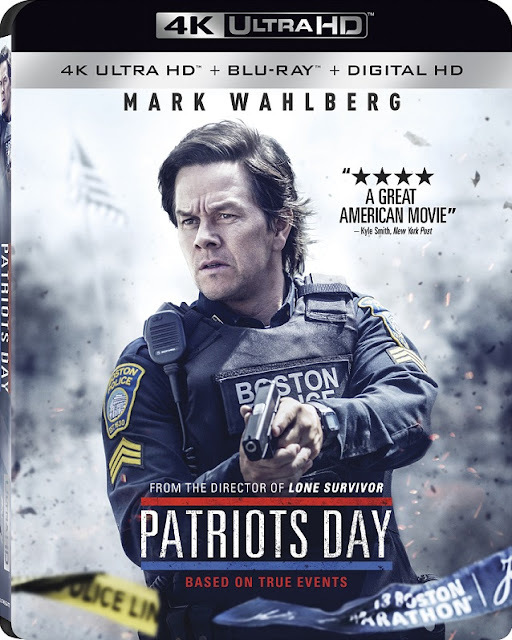 Patriots Day will be available on4K Ultra HD Combo Pack, Blu-ray Combo Pack, and DVD for $42.99, $39.99 and $29.95, respectively.